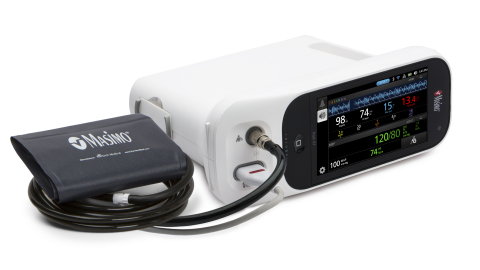 NEUCHATEL, Switzerland--(BUSINESS WIRE)--Masimo (NASDAQ: MASI) announced today the CE marking of noninvasive blood pressure (NIBP) measurements for the Rad-97™ Pulse CO-Oximeter® and connectivity hub. Rad-97 offers Measure-through Motion and Low Perfusion™ SET® pulse oximetry and upgradeable rainbow® noninvasive blood constituent monitoring technology in a compact standalone monitor configuration which can also collect and remotely transmit data from connected devices. Rad-97 with NIBP enables clinicians to measure arterial blood pressure for adult, pediatric, and neonatal patients, with three measurement modes: spot-check, automatic interval (which measures blood pressure routinely, at a desired interval), and stat interval (which continually measures blood pressure for a desired duration). An integrated port allows clinicians to connect a blood pressure cuff inflation hose directly to Rad-97, and is compatible with both disposable and reusable cuffs, for a variety of patient types, designed for reliability and patient comfort. With the addition of NIBP to Rad-97, clinicians can easily and automatically chart blood pressure data directly from the same monitoring device that measures oxygen saturation, total hemoglobin, and other noninvasive parameters. In hospital settings and when used in conjunction with Masimo Iris Gateway™ or Patient SafetyNet™*, data from Rad-97 and other devices connected via the Iris™ hub can be sent directly to the patient’s electronic medical record (EMR). With Patient SafetyNet, alarms and alerts from connected devices are seamlessly forwarded to clinicians. Rad-97 includes built-in wireless connectivity, via Wi-Fi and Bluetooth®. Using Bluetooth or a wired USB connection, Rad-97 can connect to nearby devices, such as glucometers and weight scales, and can allow the data from the connected device to be transmitted remotely. Rad-97 will be available for use on home and enterprise networks to connect to remote monitoring systems, including Patient SafetyNet. Additional devices can be simultaneously attached to Rad-97 using the Iris hub. Rad-97 features a high-resolution, 1080p HD color display with user-friendly multi-touch navigation, allowing clinicians to easily customize the device to best suit their monitoring and viewing needs. Users can also rapidly configure the device to accommodate different patient populations using customizable profiles. A rechargeable battery lasting seven hours allows Rad-97 to be used in situations where portability or extended operation without access to power are needed. An optional roll stand allows for tetherless device transport, offering additional flexibility when space is limited. Rad-97 will also be available with an optional camera, which can be used in conjunction with Masimo Patient SafetyNet. The camera will provide a high resolution, high-frame rate video feed, as well as audio, to the Patient SafetyNet view-station. When used at home, camera-equipped Rad-97 will allow patients and clinicians to interact remotely, making it well-suited as a point-of-care device for potential telehealth applications. Like Radical-7®, Rad-97 features Measure-through Motion and Low Perfusion pulse oximetry (SpO2), pulse rate (PR), and perfusion index (PI). Clinicians can add other monitoring solutions such as the rainbow SET™ measurements PVi®, total hemoglobin (SpHb®), methemoglobin (SpMet®), acoustic respiration rate (RRa®), carboxyhemoglobin (SpCO®), and oxygen content (SpOC™). Additional parameters such as Oxygen Reserve Index™ (ORi™) and respiration rate from the pleth (RRp™) are also available, making Rad-97 the smallest Masimo bedside device currently capable of monitoring the full rainbow SET platform. Rad-97 is not available in the United States. Masimo (NASDAQ: MASI) is a global leader in innovative noninvasive monitoring technologies. Our mission is to improve patient outcomes and reduce the cost of care by taking noninvasive monitoring to new sites and applications. In 1995, the company debuted Masimo SET® Measure-through Motion and Low Perfusion™ pulse oximetry, which has been shown in multiple studies to significantly reduce false alarms and accurately monitor for true alarms. Masimo SET® has also been shown to help clinicians reduce severe retinopathy of prematurity in neonates,1 improve CCHD screening in newborns,2 and, when used for continuous monitoring in post-surgical wards, reduce rapid response activations and costs.3,4,5 Masimo SET® is estimated to be used on more than 100 million patients in leading hospitals and other healthcare settings around the world. In 2005, Masimo introduced rainbow® Pulse CO-Oximetry technology, allowing noninvasive and continuous monitoring of blood constituents that previously could only be measured invasively, including total hemoglobin (SpHb®), oxygen content (SpOC™), carboxyhemoglobin (SpCO®), methemoglobin (SpMet®), and more recently, Pleth Variability Index (PVi®) and Oxygen Reserve Index (ORi™), in addition to SpO2, pulse rate, and perfusion index (PI). In studies with SpHb, reductions in blood transfusion* were observed,6,7 and when used with PVi, a reduction in 30-day mortality was observed.8 In 2014, Masimo introduced Root®, an intuitive patient monitoring and connectivity platform with the Masimo Open Connect™ (MOC-9™) interface, enabling other companies to augment Root with new features and measurement capabilities. Masimo is also taking an active leadership role in mHealth with products such as the Radius-7™ wearable patient monitor, iSpO2® pulse oximeter for smartphones, and the MightySat™ fingertip pulse oximeter. Additional information about Masimo and its products may be found at www.masimo.com. Published clinical studies on Masimo products can be found at http://www.masimo.com/cpub/clinical-evidence.htm. *Clinical decisions regarding red blood cell transfusions should be based on the clinician’s judgment considering, among other factors: patient condition, continuous SpHb monitoring, and laboratory diagnostic tests using blood samples. This press release includes forward-looking statements as defined in Section 27A of the Securities Act of 1933 and Section 21E of the Securities Exchange Act of 1934, in connection with the Private Securities Litigation Reform Act of 1995. These forward-looking statements include, among others, statements regarding the potential effectiveness of Masimo Rad-97™ Pulse CO-Oximeter® with Noninvasive Blood Pressure. These forward-looking statements are based on current expectations about future events affecting us and are subject to risks and uncertainties, all of which are difficult to predict and many of which are beyond our control and could cause our actual results to differ materially and adversely from those expressed in our forward-looking statements as a result of various risk factors, including, but not limited to: risks related to our assumptions regarding the repeatability of clinical results; risks related to our belief that Masimo's unique noninvasive measurement technologies, including Masimo Rad-97 Pulse CO-Oximeter with Noninvasive Blood Pressure, contribute to positive clinical outcomes and patient safety; as well as other factors discussed in the "Risk Factors" section of our most recent reports filed with the Securities and Exchange Commission ("SEC"), which may be obtained for free at the SEC's website at www.sec.gov. Although we believe that the expectations reflected in our forward-looking statements are reasonable, we do not know whether our expectations will prove correct. All forward-looking statements included in this press release are expressly qualified in their entirety by the foregoing cautionary statements. You are cautioned not to place undue reliance on these forward-looking statements, which speak only as of today's date. We do not undertake any obligation to update, amend or clarify these statements or the "Risk Factors" contained in our most recent reports filed with the SEC, whether as a result of new information, future events or otherwise, except as may be required under the applicable securities laws. Masimo announced today the CE marking of noninvasive blood pressure (NIBP) measurements for the Rad-97™ Pulse CO-Oximeter® and connectivity hub.